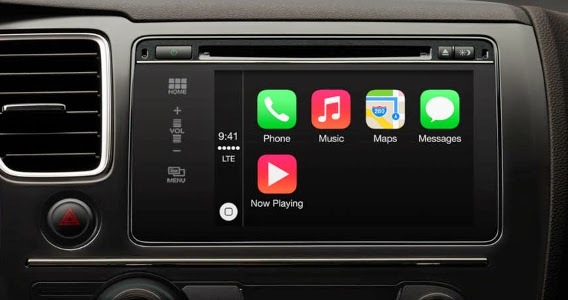 As I anticipated in my article Design Inspiration: Second Screen Designs, Apple has announced CarPlay to offer even more integration of iOS with in car systems. This is a breakthrough in mobile second screen designs, and represents an important milestone towards extensive local interconnectivity of our devices. Initial availability of CarPlay in vehicles will likely be limited, but the opportunity to deploy it via third party systems will allow nearly any vehicle to get one. Those third party products should fit quite nicely in to the car stereo and other in car products market. So it won’t be limited to just new future car models. And increased competition will drive the cost down, allowing more vehicles to get CarPlay. This also marks a name change for the initiative. Originally announced at last year’s WWDC when it was called iOS in the Car. CarPlay makes more sense and is simpler branding that is related to and consistent with AirPlay. CarPlay does have many of the features that I anticipated in my article Design Inspiration: Second Screen Designs, with a few exceptions. It supports only Lightning enabled iPhones and makes no mention of supporting Bluetooth connections or iPads. So the Lightning connector requirement limits it to only the latest iPhones, 5, 5c and 5s. Not supporting Bluetooth is not a huge deal, but it would have been nice and would have opened up compatibility to more devices while adding very little cost. Although an advantage of using the Lightening connector is that your device can charge while in use. Perhaps one of the biggest and most strategic long term gains by developing CarPlay, is that now there is even more direct support in iOS for Second Screen Designs and app developers can start taking advantage of them now in a shipping product. This will lay down a solid foundation for future uses of Second Screen Designs that I predict will arrive with the iWatch and the next generation Apple TV. Stay tuned. It’s just getting interesting…. love it. thanks for the information.